The Mexican army has freed 61 people who were being held captive by a criminal organization in the northern state of Coahuila, officials said on Sunday. Troops found the victims in a house in the town of Piedras Negras during an intelligence operation which was being carried out on Saturday. A total of 61 males were rescued while three suspected kidnappers were captured. According to a statement from the Secretariat of National Defense, one of the victims is Honduran while the rest are from various parts of Mexico. They were allegedly forced to work in the criminal organization. Meanwhile, troops were also able to locate six tons of marijuana during the operation. 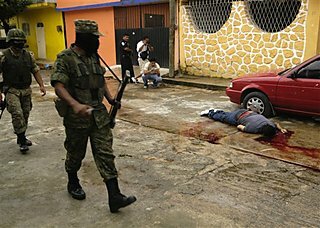 Mexico`s northern areas are marred with organized-crime-related violence due to the heavy presence of drug cartels. In April, Mexican authorities managed to rescue 119 people in the northern state of Tamaulipas in one week. Police first rescued 68 people, who were allegedly kidnapped by a regional drug cartel, during an operation in Reynosa municipality. Then they rescued 51 individuals, including 15 Guatemalans, 2 Hondurans, 2 Salvadorians, 6 Chinese and 26 Mexicans. MassacrePiedras Negras, across the border from Eagle Pass in Texas, is thought to be a stronghold of the Zetas.Last year the Zetas were blamed for the massacre of 72 foreign migrants in the northern state of Tamaulipas after they apparently refused to work for the cartel. They were also blamed for the murder of more than 100 people whose bodies were found in mass graves in Tamaulipas after apparently being kidnapped from buses. With violent murders escalating in the port of Acapulco, tourists are staying away, threatening the once-thriving destinationDaniel Reams and his wife Pamela moved from Virginia ten years ago to run a beach-side hotel in Acapulco. They have 22 rooms. But on this weekend, only four are booked. They estimate their business is off by 60 percent, reports CBS News correspondent Terry McCarthy. “We are making a living, sort of – but it is way down from what we were,” said Daniel. The problem, they say, is that the deadly drug war has been creeping closer to tourist areas. Saturday Feb. 19, 2011. 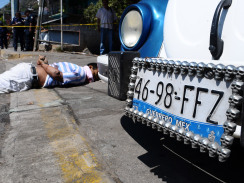 A spate of attacks on taxis in Acapulco has left 12 taxi drivers or passengers dead, police said Sunday Feb. 20, 2011, a slain Taxi driver is found just hours before the start of the Mexican Open tennis tournament. bridge. And last month, 15 decapitated men were dumped at a shopping center, all in the shadow of lucrative tourist areas. The decapitated bodies were found on the sidewalk. The drug cartels haven’t directly targeted foreign tourists, but the hotels are just 10 minutes away from here. For many Americans, that’s way too close. Now tourists see truckloads of police everywhere. Two cruise lines have just canceled their Acapulco stops taking their 5,000 passengers with them. And the city is no longer among the top 100 destinations for Americans. “You are here! You feel safe? 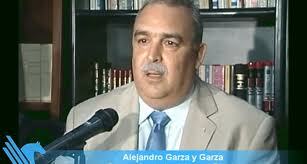 It’s safe!” answered Guerrero Governor Zeferino Toreblanca when asked if it was safe for American tourists in Acapulco. 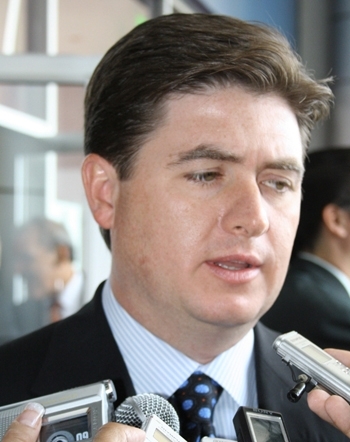 Acapulco’s governor downplays the violence, saying they expect 9 million visitors this year. But looking around – the town is eerily empty. On the main tourist strip, nightclubs — the staple of spring breakers — are struggling. On one recent Saturday night one club only had about 20 people in it. “You can see it right over here, it is a hard situation now,” said a nightclub worker, gesturing to an empty line. As violence creeps ever closer, many fear the tourists will stay further away. Four U.S. citizens were shot to death in separate attacks in the border city of Ciudad Juarez, Mexican authorities said Monday. Chihuahua state prosecutors’ spokesman Arturo Sandoval said Edgar Lopez, 35, of El Paso, Texas, was killed Sunday along with two Mexican men when gunmen opened fire on a group standing outside a house. On Saturday, a 26-year-old U.S. woman and an American boy were slain shortly after crossing an international bridge from El Paso. Giovanna Herrera and Luis Araiza, 15, were shot to death along with a Mexican man traveling with them just after 11 a.m., Sandoval said. Sandoval said authorities also identified a 24-year-old woman killed Friday inside a tortilla shop as Lorena Izaguirre, a U.S. citizen and El Paso resident. A Mexican man was also found dead in the store. Sandoval did not provide any information about possible motive in any of the slayings. U.S. State Department spokesman P.J. Crowley confirmed three of the killings but did not have any information about Izaguirre. He said officials had been in touch with the victims’ families but offered no other details. 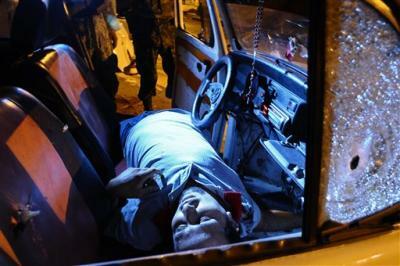 Ciudad Juarez has become one of the world’s deadliest cities amid a turf war between the Sinaloa and Juarez drug cartels. More than 2,000 people have been killed this year in the city, which is across the border from El Paso. Also Monday, federal police said they arrested a U.S. man accused of being a member of the Aztecas gang, whose members work as hitmen for the Juarez cartel and operate on both sides of the border. Angel Martinez, 24, was arrested Saturday in Ciudad Juarez when he was traveling with another gang member, the department said. Elsewhere, three city police officers were gunned down early Monday in a drive-by shooting as they patrolled the heart of Acapulco’s upscale tourist district, authorities said. Another officer was wounded, according to a statement from the Public Safety Department in southern Guerrero state, where Acapulco is located. The officers were patrolling the Puerto Marques area around 1 a.m. when they were ambushed by suspects shooting assault rifles from inside a car, police said. Violence continues to escalate in the Pacific resort city, days after Mayor Jose Luis Avila Sanchez warned people to stay indoors after dark. Ten other people were killed between Sunday and Monday around the area. 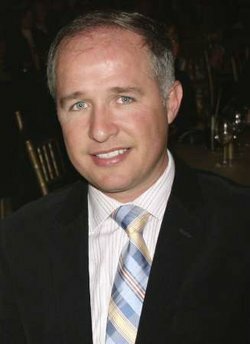 Authorities also were trying to determine whether a burned corpse found in a car was the body of a Canadian businessman who disappeared last week. Meanwhile, the remains of seven people were found Sunday in a mass grave in Nogales, on the Arizona border. Mayor Jose Angel Hernandez said a family walking near the site noticed what appeared to be part of a body sticking up in a riverbed. Officers recovered six bodies and a severed head in the grave. A seventh headless body was found nearby. In the border city of Tijuana, state police seized more than 14 tons of marijuana in two vehicles at a house in the same neighborhood where gunmen killed 13 people at a drug rehab center 10 days ago. Three people riding in a BMW with Texas license plates were killed in a shooting during the weekend in Juárez. Chihuahua state police identified the victims as Guillermo Araiza Hidalgo, 23, Luis Carlos Araiza Hidalgo, 15, and Giovanna Herrera, 26. A spokesman for the Chihuahua attorney general’s office on Sunday did not have information on whether any of the victims were El Paso residents or U.S. citizens. Police said shooters fired 50 rounds from 9 mm and .223-caliber weapons, peppering the black 2001 BMW X5 with bullets during an assault late Saturday morning on the Juárez-Porvenir road. The vehicle was being driven by Guillermo Araiza. All three died at the scene. (AP) In another grisly turn in Mexico’s drug war, police have recovered 18 bodies from a mass grave announced in a YouTube posting – a video saying the victims were from a tourist group kidnapped in Acapulco a month ago. Authorities said they would resume their search Thursday for more remains at the burial site in Tres Palos, a town just south of the Pacific resort city. Police did not yet know if the bodies found were from the 20 men abducted at gunpoint Sept. 30 while visiting Acapulco from neighboring Michoacan state, Fernando Monreal, investigative police chief for Guerrero state, said Wednesday night. Officers began digging at the site early Wednesday after receiving an anonymous phone call alerting them to two bodies dumped on an empty lot. Hours earlier, a video appeared on Youtube in which two men – their hands apparently tied behind their backs and answering questions from an unseen interrogator – say they killed “the Michoacanos” and buried them in the area. The two bodies reported in the tip were found wearing the same clothes as the pair seen in the video and were lying on top of the mass the grave. A sign left between the two men read: “The people they killed are buried here.” It was signed by Acapulco’s Independent Cartel, or CIDA – a little known drug gang that has been claiming responsibility for killings in the area over the last two months. Monreal said authorities had not confirmed the identities of the bodies dumped on top of the grave. In the video, the two men say they killed the “Michoacanos” in an act of revenge against La Familia, a powerful drug cartel based in Michoacan state. The families of the 20 missing men, many of them related to each other, have said they were mechanics in the state capital of Morelia who each year saved up money to take a vacation together. Among those abducted was the 17-year-old son of one of the mechanics. Guerrero state investigators say they corroborated that the men worked as mechanics and had no criminal records. Investigators also say they could find no evidence linking the men to any gang and have speculated the group may have been targeted by mistake. Hundreds of the men’s relatives and friends have twice marched in Morelia to demand federal authorities investigate the case. On Sunday, about 1,000 people marched to urge authorities to keep searching for their loved ones. “To the people who have them, we ask them to have mercy on them, on us,” Katy Rodriguez, a niece of seven of the missing men, said in a message sent to the captors through the media. The kidnapping was one of the biggest blows yet to Acapulco, which has seen an increase in drug-gang shootouts, beheadings and kidnappings. Even Acapulco Mayor Jose Luis Avila Sanchez recently urged residents to stay indoors after nightfall, an extraordinary pronouncement in a city where the economy is built on nightclubs, bars and restaurants. Mass killings have become more frequent amid raging, drug-fueled violence in Mexico. 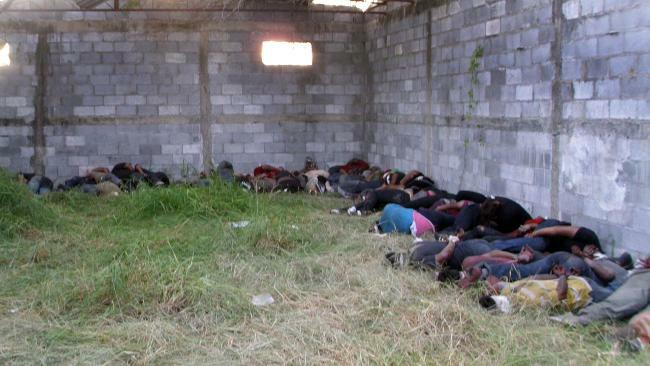 In the most horrifying attack, 72 migrants were massacred in northern Mexico near the border city of Matamoros in August, apparently because they refused to work for the Zetas drug gang. Videos like the new posting on YouTube have become a new dimension of terror to Mexico’s bloody drug war. Cartels are increasingly releasing video of kidnapped people admitting at gunpoint to crimes ranging from extortion to murder. It is often impossible to determine the veracity of confessions given under duress. In the boldest case, a video emerged less than two weeks ago showing the kidnapped brother of Patricia Gonzalez, the former attorney general of northern Chihuahua state. In the video, the brother, Mario Gonzalez, says his sister protected a street gang tied to the Juarez cartel and was behind several murders. Gonzalez, who had been kidnapped days earlier, made the statement while sitting handcuffed in a chair surrounded by five masked men pointing guns at him. His whereabouts remain unknown. Patricia Gonzalez denied any links to drug traffickers and said she is sure her brother spoke out of fear. Another video made by drug traffickers and released in July led to the arrest of a prison warden who allegedly allowed inmates allied with the Sinaloa cartel to temporarily leave the Gomez Palacio prison to murder rivals. The warden allegedly even lent the inmates guns and vehicles to carry out the killings. The Zetas drug gang, a rival of the Sinaloa cartel, first drew attention to the prison scandal by kidnapping a local police officer and forcing him to describe the scheme on a video released on the Internet. (AP) Three bystanders died in the crossfire of a shootout between gunmen, police and soldiers in northern Mexico on Sunday. The victims were a 14-year-old boy and two women aged 18 and 47, according to a statement by the prosecutors’ office in northern Coahuila state. The statement said gunmen traveling in two vehicles opened fire on a convoy of federal police and soldiers in the city of Saltillo, Coahuila. The officers and soldiers returned fire. It was not clear who fired the shots that killed the bystanders, but the state attorney general’s office said it was investigating and expressed condolences to the victims’ families. “They are civilians who unfortunately died in the exchange of gunfire,” it said, describing a running series of confrontations between police and assailants who allegedly fired shots into the air to clear bystanders from their path at one point. Mexico’s army, which has taken a leading role in combating drug gangs, has come under criticism for alleged indiscriminate use of force and firing on civilians. Three gunmen also died Sunday in a separate shootout in another Coahuila city, Torreon. Coahuila has been the scene of bloody turf battles between the Sinaloa cartel and the Zetas drug gang. In the border city of Ciudad Juarez, meanwhile, the death toll from a birthday party massacre late Friday rose to 14 after an 18-year-old male died of his wounds. Nineteen people were wounded in the attack on two private homes where about four dozen partygoers had gathered for a teen’s birthday. The dead identified so far were 13 to 32 years old, and the majority of the victims were high school students, a survivor said. While investigators said they have not yet identified the perpetrators or a motive, police found 70 bullet casings from assault weapons typically used by drug gangs at the scene of the shootings. Cartel violence has killed more than 2,000 people so far this year in the city across from El Paso, Texas. Drug gangs have increasingly attacked private parties that they believe members of rival gangs might be attending; other innocent partygoers are often killed in such attacks. On Sunday, prosecutors in northern Chihuahua state, where Ciudad Juarez is located, said they were searching for a man known only by his nickname, “The Mouse,” who was apparently the target of the gunmen. The man was reportedly wounded in the Friday shooting, but has disappeared. Investigators said they believe he can shed light on who was trying to kill him. Memorial services were held Sunday for some of the victims of Friday’s attack, and prosecutors said that guards had been provided to protect those services. Friday’s attack recalled a similar massacre in Ciudad Juarez in January, when gunmen killed 15 people at a house party. BROWNSVILLE — Gunmen presumed to be Mexican drug operatives opened fire today on a couple riding water skis on the binational Falcon Lake reservoir, possibly killing the husband and sending the woman fleeing frantically to the U.S. side. Zapata County Sheriff Sigifredo Gonzalez said the couple — believed to be from McAllen — had crossed to the Mexican side when they came under a spray of bullets by two boatloads of men. The man, 30, was shot in the head and his wife said she fears he is dead. According to unconfirmed reports, the woman circled back to get her husband but the gunmen continued shooting, even after she crossed back to the U.S. side. Gonzalez said he had contacted the Mexican consulate for help finding the husband. As of late Thursday afternoon, he was tracing down leads with the FBI, said Mary Pulido, a dispatcher fielding a barrage of press calls. “I do know that it happened on the Mexican side, that’s what’s making the investigation very difficult,” she said. The shooting follows reports in May that boaters in the famed bass fishing oasis were at risk of being shaken down by “pirates” lurking on the Mexican side. The 60-mile long Rio Grande reservoir is shared by the United States and Mexico, and due to its location along sparsely populated Starr and Zapata counties is believed to be a favorite location for trafficking drugs. Peña, as chair of the emergency preparedness committee, said the incident strengthened his resolve to fight budget cuts for DPS, who along with Border Patrol agents patrol the lake. Thursday’s reported shooting comes during what may be the most deadly and prolonged streak of Mexican drug cartel violence in memory. In May, the Texas Department of Public Safety reported several incidents of pirates shaking down U.S. boaters. The robbers in at least one case posed as Mexican federal law enforcement, searching fishing boats for guns and drugs and then demanding cash at gunpoint. The DPS issued a statement warning people not to cross to the Mexican side of the lake. Boaters were encouraged to file a float plan with family members. The warning came as the county of Zapata geared up for a summer of fishing tournaments, prompting the chamber of commerce to say that the warning was drastic and that people were safe if they stayed in U.S. waters. Falcon Lake was formed by a dam in 1953 to conserve water for agriculture and control downstream flooding. Mexican pirates operating on Falcon Lake, which is shared by the United States and Mexico, on Thursday shot an American tourist who had crossed the border on a Jet Ski. Tiffany Hartley, 29, said her husband, David Michael Hartley, 30, was shot in the back of the head as they tried to escape an ambush on the lake, The Associated Press reports. Hartley tried to turn around to save her husband but said she had to continue to retreat when she heard bullets whizzing by. Today, search teams continue to comb the Texas side of the lake for David, who is presumed dead. Zapata County Sheriff Sigifredo Gonzalez said he had asked the Mexican consulate to conduct a search on his country’s side of the lake as well. Falcon Lake pirate gangs in May after a spat of robberies prompted the Texas Department of Public Safety to issue a bulletin warning Americans to stay in U.S. waters. Authorities believe the pirates are offshoots of Mexican drug gangs operating in the area. On April 30, five American fishermen crossed the border to explore Guerrero Viejo, a town that was abandoned and flooded when the Rio Grande was dammed to create Falcon Lake in 1953. The Americans’ boat was boarded by four men who said they were federal police but were not wearing uniforms. The Texas Department of Public Safety said the men demanded to know if the fishermen had drugs before making off with $200. They also had several tattoos of the letter “Z,” raising suspicions that they were members of the Zetas drug cartel, which controls territory in northern Mexico. Like the fishermen, the Hartleys had crossed the border Thursday to see Guerrero Viejo. 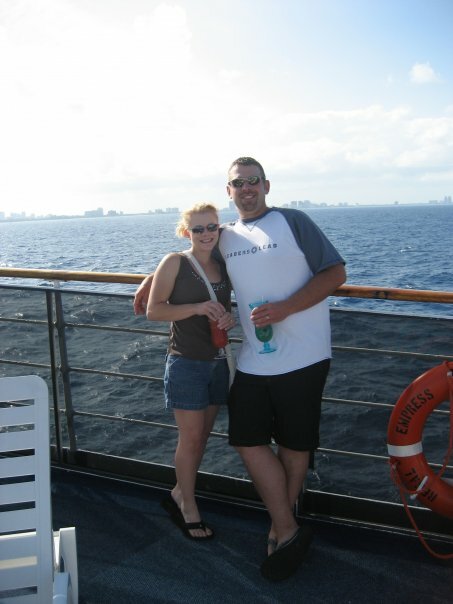 Gonzalez said today that the gunmen chased the couple into American waters, according to the AP. He also said he suspects they returned for Hartley’s body or let it sink to the bottom of the lake in the hopes of destroying evidence of his murder. 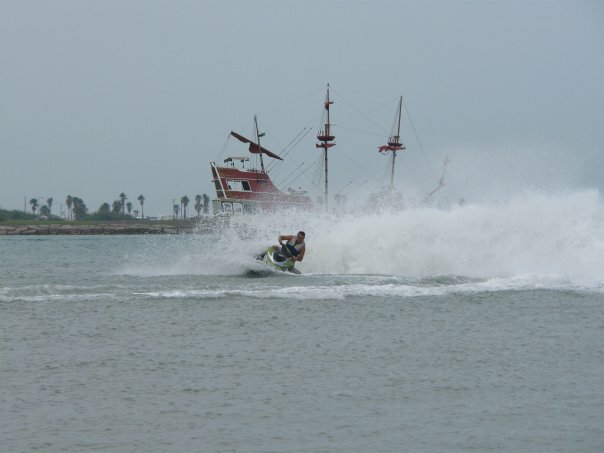 Falcon Lake, which is approximately 50 miles south of Laredo, Texas, is a water sports and fishing destination, making it a prime target for an unusual brand of piracy. There have been at least five reported attacks on the lake this year, although none of them was deadly. Texas Parks and Wildlife Department spokesman Mike Cox told the AP that the last reported sighting of the pirates was on Aug. 31, when boaters reported seeing gunmen in a small craft with “Game Wardin” spelled out in duct tape on the side of the boat. SAN ANTONIO — Texas officials planned Friday to renew warnings about pirates marauding on a U.S.-Mexico border lake after a Colorado tourist was gunned down in Mexican waters while his wife dodged bullets and raced her Jet Ski back to American soil. Search teams combed the U.S. side of Falcon Lake for David Michael Hartley, 30, whose wife told police he was shot in the back of the head Thursday after being ambushed by gunmen on boats. The gunmen are suspected pirates who have turned Falcon Lake, a waterskiing and bass fishing hotspot down the border from Laredo, into uneasy waters for fishermen and boaters. There have been at least five reported run-ins with pirates on the lake this year, though prior holdups had never been deadly. Hartley’s fate was unclear. Zapata County Sheriff Sigifredo Gonzalez said 29-year-old Tiffany Hartley fears her husband is dead. She circled back on her Jet Ski to rescue him but had to retreat when she heard bullets whizzing by. Gonzalez said he had contacted the Mexican consulate to ask them to search for Hartley on its side of the lake. Texas Parks & Wildlife Department spokesman Mike Cox said Friday that the state planned to issue a fresh warning to boaters about staying on the U.S. side of the lake. The last warning came in May, and some campers on the lake have taken to arming themselves. Falcon Lake is a dammed section of the Rio Grande that straddles the border. The border is marked by 14 partially submerged concrete towers that mark the Rio Grande’s path before the lake was created in 1954. According to Gonzalez, Tiffany Hartley told police that the couple rode their Jet Skis for sightseeing and to take pictures of a famous church in Old Guerrero. They were riding back when they saw the armed gunmen on the boats, and immediately began racing back to U.S. waters. David Hartley didn’t make it. His wife told authorities he was shot in the back in the head; Cox said one of the boats may have crossed into U.S. waters briefly while trying to run down Tiffany Hartley. Cox said Tiffany Hartley estimated that the shooting took place about five to six miles from the Texas shoreline where she parked and called for help. In April, pirates robbed another group of boaters who also went to Old Guerrero to see the church. Cox said the most recent reported pirate sighting had been Aug. 31, when boaters saw gunmen riding a small skiff with “Game Wardin” misspelled in duct tape on the side of the vessel. Cox said it appeared the pirates were trying to imitate state game warden boats they have seen patrolling the lake. Gonzalez has previously chalked up the dangerous waters as the product of fighting between rival Mexican drug gangs. Violence on the Mexican side of the lake has been climbing for several months, as a fractured partnership between the region’s dominant Gulf Cartel and its former enforcers, the Zetas, plunged many of the area’s Mexican border cities into violence. 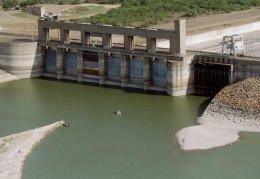 The dam along the lower Rio Grande was finished in 1954 as part of a joint U.S.-Mexico project to collect water for flood control, hydroelectric power and water for drinking and agriculture. Gonzalez’s agency was among many that responded, as did the U.S. Border Patrol, the Texas Department of Public Safety and even game wardens, who put more boats on the water. Citing security concerns, neither Homeland Security nor DPS commented. “We trust that DPS and their federal and local law enforcement partners are constantly collecting intelligence and monitoring all threats to Texas and taking the appropriate action to protect our citizens from those who would do us harm,” said Gov. Rick Perry’s deputy press secretary Katherine Cesinger. Law enforcement officials huddled at the dam, near Rio Grande City, to discuss the threat and how to stifle it, said an officer who attended the meeting. Officers interviewed by the Chronicle gave the warning varying degrees of credibility. They noted that among the Zetas ranks are Mexican military defectors who were trained in special forces tactics, including demolition. Special cameras were set up along the dam, which has six 50-foot-tall steel gates, and lawmen hid in brush. A Mexican military spokesman, who spoke on the condition of anonymity, said he had not heard of any threat to the Falcon Dam and expressed doubt that the Zetas would try such an attack. “This isn’t the way these groups operate, they have never attacked installations like that,” he said. Rick Pauza, a spokesman for Customs and Border Protection, in Laredo, said the port of entry at the dam had been at a heightened alert due to violence in Mexico. The attack may have been thwarted in Mexico. It raises the fear of what the powerful cartels could do. With handbills and bullhorns, members of the Zeta cartel are said to have warned the civilian population on the Mexican side of the river near the dam to get out of the area, according to residents and intelligence information from law enforcement officials. A border law enforcement official told the Chronicle the warnings originated in part by the seizure of small amounts of dynamite near the dam, and the discovery of a copy of the alert on the Mexican side of the border. Capt. Francisco Garcia, of the Roma (Texas) Police Department, said there was no way to know what the traffickers were capable of doing, but bringing down the dam would require nearly a tractor-trailer full of dynamite. TUCSON — Sgt. David Azuelo stepped gingerly over the specks of blood on the floor, took note of the bullet hole through the bedroom skylight, raised an eyebrow at the lack of furniture in the ranch-style house and turned to his squad of detectives investigating one of the latest home invasions in this southern Arizona city. “At least they didn’t put the gun in the baby’s mouth like we’ve seen before,” Sergeant Azuelo said. That same afternoon this month, his squad was called to the scene of another home invasion, one involving the abduction of a 14-year-old boy. This city, an hour’s drive north of the Mexican border, is coping with a wave of drug crime the police suspect is tied to the bloody battles between Mexico’s drug cartels and the efforts to stamp them out. Since officials here formed a special squad last year to deal with home invasions, they have counted more than 200 of them, with more than three-quarters linked to the drug trade. In one case, the intruders burst into the wrong house, shooting and injuring a woman watching television on her couch. In another, in a nearby suburb, a man the police described as a drug dealer was taken from his home at gunpoint and is still missing. Tucson is hardly alone in feeling the impact of Mexico’s drug cartels and their trade. In the past few years, the cartels and other drug trafficking organizations have extended their reach across the United States and into Canada. Law enforcement authorities say they believe traffickers distributing the cartels’ marijuana, cocaine, heroin, methamphetamine and other drugs are responsible for a rash of shootings in Vancouver, British Columbia, kidnappings in Phoenix, brutal assaults in Birmingham, Ala., and much more. United States law enforcement officials have identified 230 cities, including Anchorage, Atlanta, Boston and Billings, Mont., where Mexican cartels and their affiliates “maintain drug distribution networks or supply drugs to distributors,” as a Justice Department report put it in December. The figure rose from 100 cities reported three years earlier, though Justice Department officials said that may be because of better data collection methods as well as the spread of the organizations. Gov. Rick Perry of Texas has asked for National Guard troops at the border. The Obama administration is completing plans to add federal agents along the border, a senior White House official said, but does not anticipate deploying soldiers. The official said enhanced security measures would include increased use of equipment at the ports of entry to detect weapons carried in cars crossing into Mexico from the United States, and more collaboration with Mexican law enforcement officers to trace weapons seized from crime scenes. Law enforcement officials on both sides of the border agree that the United States is the source for most of the guns used in the violent drug cartel war in Mexico. “The key thing is to keep improving on our interdiction of the weapons before they even get in there,” said Janet Napolitano, the secretary of homeland security and the former governor of Arizona, who will be testifying before Congress on Wednesday. Sergeant Azuelo quickly began to suspect that the pistol whipping he was investigating was linked to a drug dispute. Within minutes, his detectives had found a blood-spattered scale, marijuana buds and leaves and a bundle of cellophane wrap used in packing marijuana. Most often, police officials say, the invasions result from an unpaid debt, sometimes involving as little as a few thousand dollars. But simple greed can be at work, too: one set of criminals learns of a drug load, then “rips” it and sells it. At times, the police have been overwhelmed by the sheer firepower in the hands of drug traffickers, who have armed themselves with assault rifles and even grenades. Although overall violent crime has dropped in several cities on or near the border — Tucson is an exception, reporting a rise in homicides and other serious crime last year — Arizona appears to be bearing the brunt of smuggling-related violence. Some 60 percent of illicit drugs found in the United States — principally cocaine, marijuana and methamphetamine — entered through the border in this state. The city’s home-invasion squad, a sergeant and five detectives working nearly around the clock, was organized in April. Phoenix assembled a similar unit in September to investigate kidnappings related to drug and human smuggling. In the last two years, the city has recorded some 700 cases, some involving people held against their will in stash houses and others abducted. The state police also have a new human-smuggling squad that focuses on the proliferation of drop houses, where migrants are kept and often beaten and raped until they pay ever-escalating smuggling fees. Tying the street-level violence in the United States to the cartels is difficult, law enforcement experts say, because the cartels typically distribute their illicit goods through a murky network of regional and local cells made up of Mexican immigrants and United States citizens who send cash and guns to Mexico through an elaborate chain. The cartels “may have 10 cells in Chicago, and they may not even know each other,” said Michael Braun, a former chief of operations for the Drug Enforcement Administration. Elizabeth W. Kempshall, who is in charge of the drug agency’s office in Phoenix, said the kind of open warfare in some Mexican border towns — where some Mexican soldiers patrol in masks so they will not be recognized later — has not spilled over into the United States in part because the cartels do not want to risk a response from law enforcement here that would disrupt their business. But Mrs. Kempshall and other experts said the havoc on the Mexican side of the border might be having an impact on the drug trade here, contributing to “trafficker on trafficker” violence. For one thing, they say, the war on the Mexican side and the new border enforcement are disrupting the flow of illicit drugs arriving in the United States. The price of cocaine, for instance, a barometer of sorts for the supply available, has surged. With drugs in tighter supply, drug bosses here and in Mexico take a much harder line when debts are owed or drugs are stolen or confiscated, D.E.A. officials said. Although much of the violence is against people involved in the drug trade, law enforcement authorities said such crime should not be viewed as a “self-cleaning oven,” as one investigator put it, because of the danger it poses to the innocent. It has also put a strain on local departments. Several hours after Sergeant Azuelo investigated the home invasion involving the pistol whipping, his squad was called to one blocks away. This time, the intruders ransacked the house before taking a 14-year-old boy captive. Gang investigators recognized the house as having a previous association with a street gang suspected of involvement in drug dealing. The invaders demanded drugs and $10,000, and took the boy to make their point. He was released within the hour, though the family told investigators it had not paid a ransom. “You don’t know anybody who is going to pay that money?” the boy said his abductors kept asking him. The boy, showing the nonchalance of his age, shrugged off his ordeal. “No, I’m not scared,” he said after being questioned by detectives, who asked that his name not be used because the investigation was continuing. Not all the problems are along the border. The Atlanta area, long a transportation hub for legitimate commerce, has emerged as a new staging ground for drug traffickers taking advantage of its web of freeways and blending in with the wave of Mexican immigrants who have flocked to work there in the past decade. Last August, in one of the grislier cases in the South, the police in Shelby County, Ala., just outside Birmingham, found the bodies of five men with their throats cut. It is believed they were killed over a $450,000 debt owed to another drug trafficking faction in Atlanta. The spread of the Mexican cartels, longtime distributors of marijuana, has coincided with their taking over cocaine distribution from Colombian cartels. Those cartels suffered setbacks when American authorities curtailed their trading routes through the Caribbean and South Florida. Since then, the Colombians have forged alliances with Mexican cartels to move cocaine, which is still largely produced in South America, through Mexico and into the United States. The Mexicans have also taken over much of the methamphetamine business, producing the drug in “super labs” in Mexico. The number of labs in the United States has been on the decline. While the cartel networks have spread across the United States, the border areas remain the most worrisome. At the scene of the pistol-whipping here, Sergeant Azuelo and his team methodically investigated. Their suspicions grew as they walked through the house and noticed things that seemed familiar to them from stash houses they had encountered: a large back room whose size and proximity to an alley seemed well-suited to bundling marijuana, the wife of the victim reporting that they had no bank accounts and dealt with everything in cash, the victim’s father saying over and over that his son was “no saint” and describing his son’s addiction problems with prescription drugs. A digital scale with blood on it was found in a truck bed on the driveway, raising suspicion among the detectives that the victim was trying to hide it. The house, the wife told them, had been invaded about a month ago, but the attackers left empty-handed. She did not call the police then, she said, because nothing was taken. Finally, they saw the cellophane wrap and drug paraphernalia and obtained a search warrant to go through the house more meticulously. All in all, Sergeant Azuelo said, it was a run-of-the-mill call in a week that would include at least three other such robberies.